Home > Food Advice > Is It a Good Idea to Drink a Protein Shake before Bed? Is It a Good Idea to Drink a Protein Shake before Bed? Protein shakes have long been an easy and convenient way to increase protein intake, which can help you with weight loss, muscle growth, recovery, and more. But is there an ideal time of day to have this popular post-workout drink? Is a protein shake before bed good or bad? A classic protein shake will contain one to three tablespoons of protein powder along with some filtered water—or dairy-free milk, if you prefer. Many exercise clubs and gyms these days will sell protein shakes and smoothies; however, they also contain much more sugar than your standard do-it-yourself protein shake. That is why combining protein powder with liquid in an easy-to-shake blender bottle is generally the way to go. In this article, we will explore the benefits of drinking a protein shake before bed, in particular. We will also look at the various ways to drink a protein shake, as well as potential precautions or disadvantages of consuming a protein shake at bedtime. According to the Institute of Medicine at the National Academy of Sciences, the recommended daily minimum protein intake for adults who are at an average activity level and weight is about 46 g for women and 56 g for men. That being said, these are minimal amounts, and they may be low for active or ill individuals. At the same time, we live in society where more is often considered better. Over the years, drinking protein shakes has become popular among athletes, bodybuilders, and active adults. What is the best time to have a protein shake to obtain the benefits? Protein shakes have become a convenient option for breakfast or an afternoon snack. Some may even have a protein shake after a workout. However, a protein shake before bed is the best time to drink one, according to current research. In this section, we tell you how having a protein shake before bed will help improve weight loss, muscle growth, recovery time, and the quality of your sleep. You can have a protein shake before bed to lose weight since protein stimulates muscle growth and boosts metabolism. Although metabolism slows down during sleep, it continues to work, and your protein shake is still digested and absorbed by your body. When you consume a protein shake before bed, you also increase the amount of energy being burned while you sleep. A study published in the British Journal of Nutrition in 2013 reported that nighttime consumption of protein powder such as whey protein or casein protein in the hours before sleep had a positive effect the next morning on metabolism in 11 college-aged, active men, when compared to a non-energy-containing placebo. Another study published in the journal Medicine and Science in Sports and Exercise in 2012 found that protein consumption before bed stimulates muscle protein synthesis during sleep, and this improves muscle recovery and may reduce or prevent muscle loss associated with aging or diseases like cancer. That being said, your overall calorie intake should still be considered. Protein powders used to make a shake have various ranges of calories; however, most powders will have 110 to 170 calories per serving. You will also combine the protein powder with a beverage. You can use filtered water to avoid more calories. But, if you use milk, non-dairy milk, or orange juice, this may add more than 100 calories. You should aim to choose a high-quality, amino acid-rich protein shake with fewer than 200 calories before bed. If you don’t go over your daily caloric intake, a protein shake before bed may have its benefits. For instance, protein stimulates metabolism, and this promotes weight loss and speeds up the rate at which you burn calories. Research suggests that consuming 40 g of protein before bed can best stimulate muscle growth during sleep. A protein shake may total between 160 and 300 calories. Subtract the before-bed protein shake calories from your total daily caloric intake to ensure you don’t exceed your limit. You can also drink a protein shake before bed when you miss dinner or are hungry after dinner. This is where a protein shake can help prevent binging on snacks or overeating before bed. You can also drink a protein shake before bed for bodybuilding since it is great for athletes and active adults. When an athlete doesn’t consume enough daily protein, muscle growth and repair will not occur, and the body will break down muscle tissue and use it as fuel. Therefore, more protein is required when performing hard workouts for the stimulation of muscle growth and muscle protein synthesis. Protein consumption helps keep muscle protein in balance, and the essential amino acids in protein are important during this process. Drinking a protein shake before bed and after a workout can help bring your body back into a positive protein balance, and this can provide optimal muscle growth. In one study published in The Journal of Nutrition in 2016, researchers found that consumption of 40 g of protein before bed could increase muscle protein growth in 23 older men who exercised at night. Another study published in The Journal of Nutrition in 2017 examined how protein consumption before bed may increase muscle growth in older men. For the study, 48 older men consumed 20 g of protein, 40 g of protein, or a placebo before bed. The men taking 40 g of protein showed the best results of increased muscle growth and the most amino acids. Another study from 2015 had assessed the effects of protein supplementation before sleep on muscle mass and muscle strength gains during resistance-type exercise training. The study included 44 young men who performed resistance training three times weekly for a 12-week timeframe. The participants consumed a supplement drink with 27.5 g of protein and 15 g of carbohydrates or a placebo before bed. The protein and carb drink led to greater muscle mass and strength than the placebo drink. Other research published in the journal Nutrients in 2016 again showed that at least 40 g of protein consumption before bed may improve skeletal muscle and stimulate muscle protein growth after performing resistance-type exercise. Consumption of a protein shake before bed can stimulate muscle protein synthesis without impairing your sleep cycle. Certain amino acids from protein are needed to control mood and help with sleep. Proteins also help with neurotransmitter function. For instance, protein consumption can help with the uptake of the amino acid L-tryptophan into the brain. L-tryptophan is a precursor to 5-hydroxytryptophan (5-HTP)—an important neurotransmitter associated with your sleep cycle. One 2013 study found that diets with 56% protein, 22% fat, and 22% carbs improved sleep and led to fewer waking episodes. Another published in The American Journal of Clinical Nutrition in 2016 found that overweight individuals improved their sleep quality when more protein had been included in their diet. Other research published in the journal Sports Medicine in 2014 found that diets high in protein may improve your sleep quality and overall sleep experience. What is the best protein shake before bed? Protein powder is a supplement that can provide dietary protein from both animal and plant sources. As a result, there are a number of ways to make a protein shake. The most common animal-based protein powders include whey, casein, bone broth, egg, and collagen protein powders. Many of these protein powders blend well in a smoothie. You can also add them to a blender bottle with filtered water and shake well for an easy-to-make protein shake. Be sure to choose your protein powder based on your goals and preferred diet type, including gluten-free, ketogenic, paleo, low-carb, and weight loss diets. What about a vegetarian or vegan protein shake before bed? Options for vegan and vegetarian protein powders include brown rice, soy, pea, hemp, and pumpkin seed protein powders. What are the precautions or potential disadvantages of drinking a protein shake before bed? Protein powder should not be used as a replacement for the protein in whole foods. Protein-rich foods like legumes, eggs, fish, and meat not only supply a good amount of protein per serving, but they also have important minerals and vitamins the body needs to function at its best. Also, avoid protein shakes with added sugar, especially before bed. Drinks with added sugar may lead to weight gain and boost energy levels, and this makes it more difficult to sleep. In addition, more is not better when it comes to protein powder. Excessively high amounts of protein powder can also lead to kidney damage, bone loss, and liver problems. You should aim to get the best-quality protein powders, and purchase organic protein powders from reputable retailers with minimal fillers and ingredients. The addition of a protein shake before bed to your routine can help with weight loss, muscle growth, muscle protein synthesis, and the quality of your sleep. Certain protein powders can also improve heart health, boost immunity, and reduce appetite. When you work out late at night, a protein shake before bed may also be your only option. It is critical to drink a protein shake within 30 minutes of exercise to help with recovery. Some of the best protein powders come from casein, whey, bone broth, collagen, egg, hemp, pumpkin seed, pea, soy, and brown rice. Remember that protein powders do not replace protein from vitamin and mineral-rich whole foods like legumes and meat. “Protein Shakes Explained,” Coach Mag, July 25, 2018; http://www.coachmag.co.uk/nutrition/1160/protein-shakes-explained, last accessed September 28, 2018. 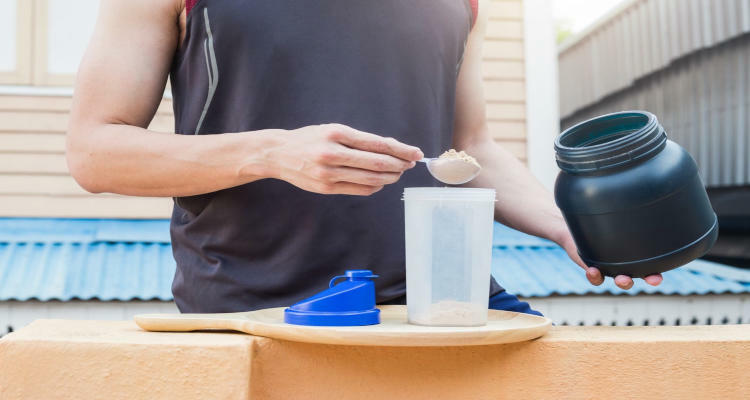 Van De Walle, G., “The 6 Best Protein Powders for Men,” Healthline, September 20, 2018; https://www.healthline.com/nutrition/best-protein-powders-for-men, last accessed September 28, 2018. Busch, S., “Will Drinking Protein Shakes Before Bed Promote Weight Loss?” Livestrong, October 3, 2017; https://www.livestrong.com/article/302686-protein-shakes-before-bed-and-weight-loss/, last accessed September 28, 2018. Mateljan, G., The World’s Healthiest Foods: Essential Guide for the healthiest way of eating (Seattle: George Mateljan Foundation), 778. Leal, D., “The Benefits of Having a Protein Shake Before Bed,” VeryWellFit, last updated August 29, 2018; https://www.verywellfit.com/benefits-of-having-a-protein-shake-before-bed-4163465, last accessed September 28, 2018. Boland, J., “9 Signs of a Protein Deficiency + How to Fix,” Dr. Axe; https://draxe.com/protein-deficiency/, last accessed September 28, 2018. Levy, J., “Protein Foods: 8 Health Benefits of Foods High in Protein,” Dr. Axe; https://draxe.com/protein-foods/, last accessed September 28, 2018. Madzima, T.A., et al., “Night-time consumption of protein or carbohydrate results in increased morning resting energy expenditure in active collage-aged men,” British Journal of Nutrition, June 2013; 111(1): 71-77, doi: 10.1017/S000711451300192X. Kouw, I.W.K., et al., “Protein Ingestion before Sleep Increases Overnight Muscle Protein Synthesis Rates in Healthy Older Men: A Randomized Controlled Trial,” The Journal of Nutrition, August 2017; 147(12): 2252-2261, doi: 10.3945/jn.117.254532. Snijders, T., et al., “Protein Ingestion before Sleep Increases Muscle Mass and Strength Gains during Prolonged Resistance-Type Exercise Training in Healthy Young Men,” The Journal of Nutrition, June 2015; 245(6): 1178-1184, doi: 10.3945/jn.114.208371. Holwerda, A.M., et al., “Physical Activity Performed in the Evening Increases the Overnight Muscle Protein Synthetic Response to Presleep Protein Ingestion in Older Men,” The Journal of Nutrition, July 2016; 146(7): 1307-1314, doi: 10.3945/jn.116.230086. Trommelen, J., et al., “Pre-Sleep Protein Ingestion to Improve the Skeletal Muscle Adaptive Response to Exercise Training,” Nutrients, Nov. 2016, 8(12): 763, doi: 10.3390/nu8120763. Tack, C., “When is the best time to take a protein shake?” My Protein; https://www.myprotein.co.in/blog/supplements/whey-casein-protein-shakes-nighttime-before-bed-benefits/, last accessed September 28, 2018. Link, R., “Protein Powder: 7 Best Types + How to Use,” Dr. Axe, August 22, 2018; https://draxe.com/protein-powder-best-types/, last accessed September 28, 2018. “Are Protein Shakes Before Bed Good to Help You Get Ripped?” SFGate; https://healthyeating.sfgate.com/protein-shakes-before-bed-good-ripped-11472.html, last accessed September 28, 2018.